What is a theodolite and why do you need one? These are two very good questions, but we’ll ignore them for the moment and provide some background information. With the introduction of the iPhone 3G and 3GS, Apple introduced something that went beyond a mobile phone, mobile music player, mobile movie player, and so on. They put a toe into the world of geography. The iPhone 3G and 3GS comes with an application, Compass, that can point to true north, or magnetic north, and also display your latitude and longitude. Press a zoom button and you are switched to a Google Maps representation of where you are, with the option of showing the area as viewed by satellite. With a few more finger presses you can get directions from where you are to somewhere else. Google took advantage of these capabilities by releasing Google Earth for the iPhone, one of the all-time favorite iPhone applications. Hundreds of other developers released applications for finding where you left your car, finding local businesses based on location, and other location-aware functions. Hunter Research & Technology took a different path. Rather than use your location to tell you more about the world around you, they decided to provide more information about your location, and produced Theodolite. A theodolite is a surveying instrument that can trace its history back half a millennium, to the time when surveyors first started taking advantage of both telescopes and compasses. Telescopes, together with a simple pendulum and ruler, allowed surveyors to very accurately determine the height and width of objects, even at a distance, based on horizontal and vertical angles. Combined with increasingly accurate compasses, theodolites helped build large palaces and fortifications as well as revolutionized surveys of coastlines and mapmaking. Today, theodolites are a standard tool of surveyors, used for plotting housing subdivisions, determining property lines, planning highways, and almost any other task for which exact spatial coordinates are required. 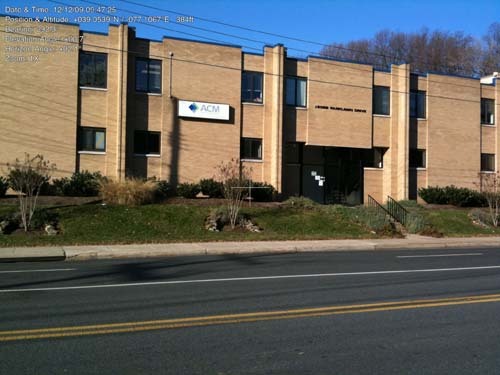 Figure 1: Theodolite photo of the building housing Washington Apple Pi’s corporate offices. Overprinted information includes the date and time, a position of 39.0539ºN and -077.1067ºE, with an altitude of 384 feet. The photo was taking with a bearing of 292.3º, an elevation angle of +0.7º, and a horizontal angle of +02.1º. Click on photo for larger view. Theodolite for the iPhone makes no pretense of being a precision surveying instrument. The developer is marketing it more as an “augmented reality” application, allowing you to know more about where you are. Theodolite takes photos and overprints location information, as shown in Figure 1, including date and time, latitude and longitude, elevation, bearing (position with respect to true north), elevation angle, and horizon angle. 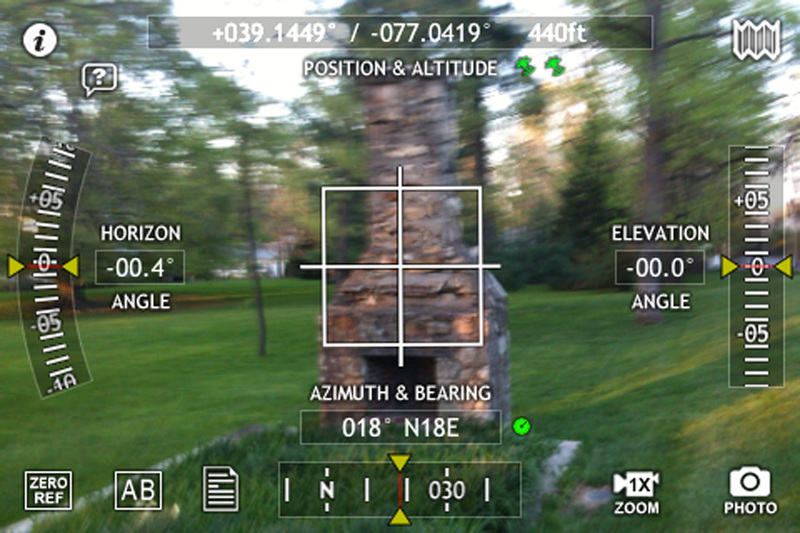 Figure 2 shows how Theodolite appears on the iPhone’s screen. While it initially looks a bit cluttered, it is logically divided according to function. Various buttons along the edges allow you to bring up a screen for adjusting settings and doing calibrations, another launches Safari so you can read the documentation on Hunter’s Web site, another launches Google Maps, another allows you to zero reference your settings, another is used for determining distance via A/B references, another “zooms” the camera, and the button in the lower right corner takes a photo. Figure 2: Theodolite’s screen shows an image as viewed through the iPhone camera overlaid with various buttons and readings. This screen capture was made in Olney, MD, at +039.1449ºN, -077.0419ºE, altitude 440 feet, near Olney Theater. Click on photo for larger view. Most of the screen is given over to whatever you are viewing through the camera, overlaid with latitude and longitude, elevation, elevation angle, horizon angle azimuth and bearing, and a central target grid. The central grid is the most important feature when taking a photo, as it helps you (if you are paying attention) hold the iPhone with minimal horizontal and vertical tilt. To evaluate the accuracy of Theodolite, you need an exact reference point for comparison. Deep in the heart of Silver Spring, MD, is Hassler Park, a tiny little concrete and stone enclave off of East-West Highway, just a few hundred feet from the District of Columbia. The park is dedicated to Ferdinand Hassler, a Swiss surveyor appointed by Thomas Jefferson to be the first Superintendent of the United States’ Survey of the Coast. In the center of the park is a marble plinth topped by a brass marker placed by the U.S. Coast & Geodetic Survey (the modern successor to the Survey of the Coast), establishing it as reference point “Hassler” in 1993. An online form allows you to recover the station GPS information (see References). Theodolite, taking a photo directly over the marker (Figure 3), recorded the position as +38.9927º, -077.0313º, with an altitude of 397 feet. 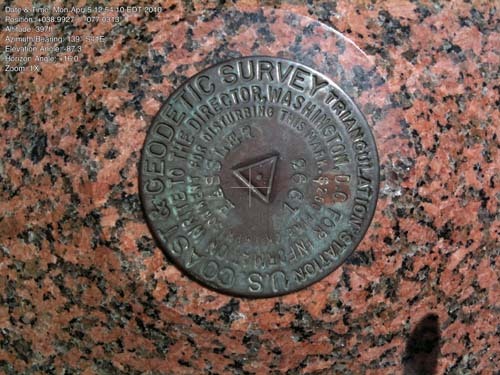 U.S. Coast and Geodetic Survey indicates the marker is at 38º 59’34.03378” N, 77º 01’52.39173” W, with no indication of height. Factoring in the differences between decimal degrees and degrees, minutes and seconds, and GPS interference from tall buildings surrounding the park, the two sets of coordinates are a very close match. Figure 3: The Station Hassler survey marker, shot from directly overhead with Theodolite. Overwritten on the image is the time and date, a position of +038.9927º, -077.0313º, an altitude of 397 feet, azimuth/bearing of 139º S41E, elevation angle of -87.3º, horizontal angle of +160º, and no zoom. There are slight differences in how the information is displayed from the earlier photo of the Pi offices, taken four months earlier, thanks to updates from the publisher. Click on photo for larger view. Theodolite has a number of uses, from house shopping (take a photo of a house and then use the LAT/LONG information to look up information about the neighborhood, or check on deed information in country records) to hiking (take a photo of some object or place, and look it up after the fact), but in my case, the interest is photography. While there is a GPS attachment for my most capable camera, it costs as much as an entire digital point and shoot camera, and makes my already large camera even more cumbersome. But with Theodolite, I can capture a wealth of GPS information with my iPhone, and then add it to the photo ex post facto. In practice, this works reasonably well, with some limitations. For example, a photo taken inside Verizon Center before a concert gave LAT/LONG information that placed me across the street, at sea level. This was, except for altitude, surprisingly accurate, as the iPhone obviously can’t pick up GPS satellite information inside a building, especially one named for a competing phone vendor. Photos taken outdoors tend to be accurate to within 10 to 50 feet; trees, buildings, and strong sources of radio noise are all limiting factors. For my purposes, the results are excellent. Embolden, I tried out Theodolite in Scotland. In keeping with Scottish tradition, I was too cheap to buy a UK data plan, and left the iPhone in “Airplane” mode. Not too surprisingly, Theodolite claimed I was still in Maryland, along a lonely stretch of Route 108. Why it picked that part of Maryland isn’t clear, but every photo in Scotland was imprinted with the same LAT/LONG. Presumably, turning the iPhone radio on would have corrected this problem, though it is unclear if I’d need a UK data plan as well. Taking photos with Theodolite isn’t all that easy, mostly because taking a photo with a smooth-sided iPhone isn’t easy. Several images have a geo-referenced view of a finger, due to the unfortunate placement of the camera lens, and a couple have a view of part of the carrying case for the iPhone. One surprise: while a normal iPhone 3GS photo has LAT/LONG information in the photo’s EXIF data, and this can be picked up and used by the Places function in iPhoto ’09 or Aperture 3, Theodolite does not include LAT/LONG in the EXIF data. Writing to the publisher, I was told that Apple does not allow developers access to the EXIF data, probably for privacy reasons. Apple probably doesn’t want evil developers to create apps that might be used to secretly track the user. At its introductory price of $0.99, Theodolite was a bargain. It still is at the current price of $3.99. For a brief primer on digital compass readings, see the accompanying article, Degrees of separation: compasses go digital. And check out these additional photos of Theodolite in action.